Phun is a challenging and fun 2D game where you can let your imagination run loose. Create objects from different sizes and of varying shapes. You can then make your objects come to life. Although it might seem simple, the game is very educational and very addictive. The game graphics has a cartoony feel which makes it fun to look at and easy to make. It features fun and believable graphics which encourages players to come up with new things and objects. Phun can be accurately described as a toy rather than a game. It is essentially a sandbox game, meaning, players can pretty much do anything they want. The main premise for Phun is that players use different objects and see how each object interacts with each other. There is no goal to the whole game but instead it fosters the players imagination; forcing players to think about what and how a particular object reacts. 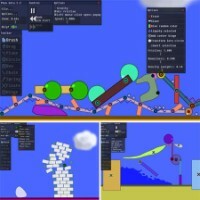 The game works by having players put together different objects and once they hit the “play” button, users can see how each of them interact with each other. Although most of them behave rather predictably, there are times when the objects don’t react accordingly and will force players to think about how to fix them. Controls are easy since almost everything is a point and click of the mouse. Players can use the pre-created objects but it is also possible to add irregularly shaped objects. The object density is also very real and something that players can define for themselves. Phun is definitely an entertaining and challenging game. The game is still in its beta stages so in case it doesn’t run when you try it, check the developer’s site for it. It runs on three platforms, Linux, Windows and Mac.